Bob Conge aka Plaseebo kindly shares details of his latest “MISFITS” custom, the incredible ‘Mars Attack’ robot! 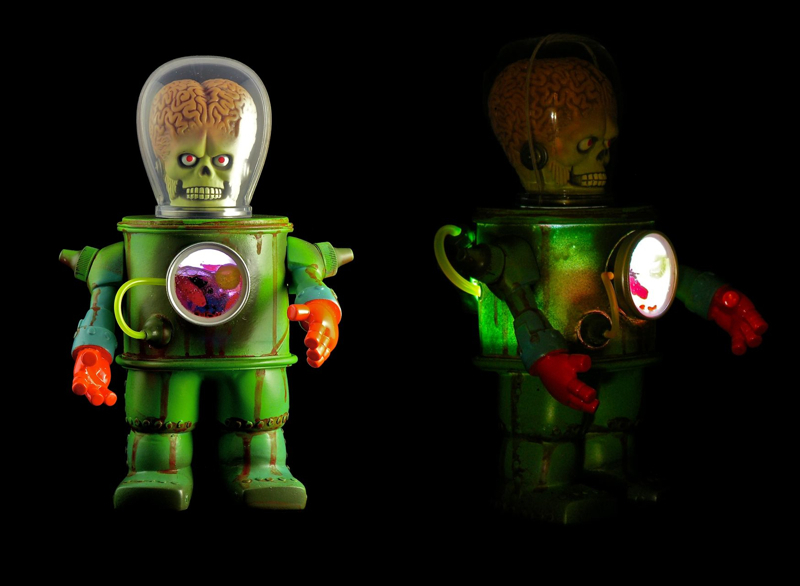 Created for this week’s New York Toy Fair 2013, Mars Attack is the third entry into Plaseebo’s ultra limited custom series, featuring the standard kit-bashed and originally sculpted body with a ‘Mars Attacks’ inspired head and see-through dome. Standing at an impressive 9″ tall, the hand cast and painted resin piece is once again finished with Bob’s signature body chamber filled with a “magical mix” of slowly moving gel colours and shapes that are illuminated from the back by a switched, colour changing LED unit. On display at the fair until Thursday, February 13th, head over to the Toy Tokyo booth (#5032) to check him out… No news on pricing as of yet, but we’re guessing ‘Mars Attack’ will be hitting the Plaseebo store at some point next week with a price point of around $850 plus.